We are too excited of beeing at Euroluce 2015. This is the biggest lighting fair ever and you can see everything here from the best floor lamps to the most wonderful chandeliers that you ever seen. Everything is stunning! Take a look at the best brands at iSaloni 2015. Karakter is a newly established lifestyle brand whose aim is to create timeless and innovative designs, with functionality and quality as cornerstones of their objects permanent value. Delightfull’s lighting reflects a personality, a frame of mind, and strong emotions are present in each detail. 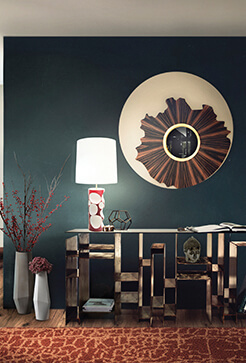 Working with their hands DelightfULL’s artisans transfer their passion and devotion into everything they make. Born in the heart of Tuscany, officina Luce is a new brand of decorative lighting fixtures with contemporary cosmopolitan chic style. It is a workshop of ideas involving a team with over thirty years of experience in fixtures production and artisanal lampshade craft.